Who remembers the old Mud Dock Deli? 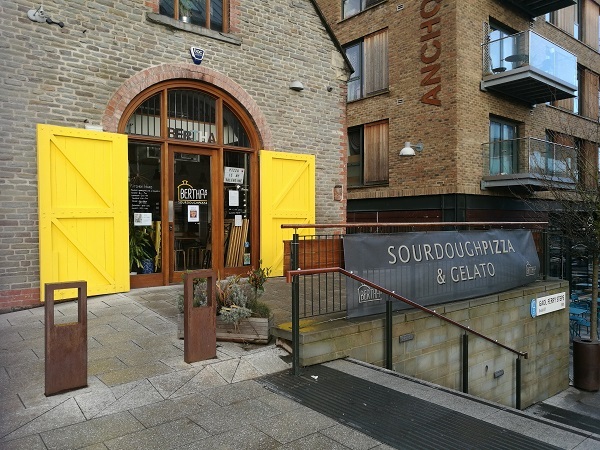 When the development of Wapping Wharf originally began, it closed down and the building temporarily became the site’s marketing centre. At the time, I was gutted: living on Cumberland Road, I was a regular visitor, using it as an excuse to get out of the flat (I work from home) to treat myself to a coffee or some lunch. Now, with the plethora of bars, cafés and restaurants at Wapping Wharf, I’m spoilt for choice – it’s a little dangerous. Weekend pastries from the Assembly Bakery, an invigorating matcha latte from Better Food, two cakes for £5 from Mokoko…it’s far too easy to let temptation get the better of me. And when it comes to pizza, Wapping Wharf is the perfect place to go, too. Not only do we have the Pizzarova crate on our doorstep, but also Bertha’s Pizza in the former Mud Dock Deli premises. The place opened in August 2016, but that wasn’t the beginning of the Bertha’s Pizza journey. The story started in 2010 with a backyard pizza oven, followed by the fitting out of their bold yellow Land Rover, complete with pizza oven in the back, that still continues to pop up at street food markets, festivals and private events across the South West and beyond. Upstairs, you’ll find a cosy seating area, with plenty of natural wood giving the place a pretty rustic feel. Downstairs, the focal point is their mosaic tiled beauty of a pizza oven, specially crafted in Naples and – when combined with the care and quality ingredients that go into their creations – which turns out some of the best pizzas Bristol has to offer. The ingredients and the process are key to the Bertha’s Pizza team: their sourdough pizza bases are made by hand using their carefully nurtured sourdough starter. Why sourdough? Well, partly because of the flavour, and partly because the fermentation in the process breaks down the dough’s gluten chains, creating a base that’s also easier for the body to digest – you’ll not find stodgy high street-style pizzas here. The toppings list is short but varied, with toppings selected based on their quality, provenance and, of course, flavour. Pizzas are priced from around £6 to £13, and you’ll also find a selection of nibbles – think Nocellara olives, garlic bread and house-smoked almonds – on offer too. There’s a salad to have on the side if you want it, and a regularly-changing choice of dips for your crust as well. And on the drinks front, there’s a decent selection of all sorts of alcoholic and non-alcoholic choices, sourced both from locally and beyond – not just your mass market brands. 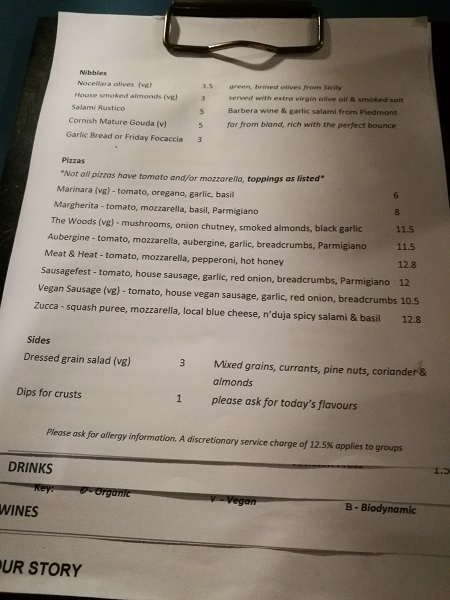 When I visited recently with friends, there was a choice of eight pizzas on offer – including two vegan options, which is always good to see. 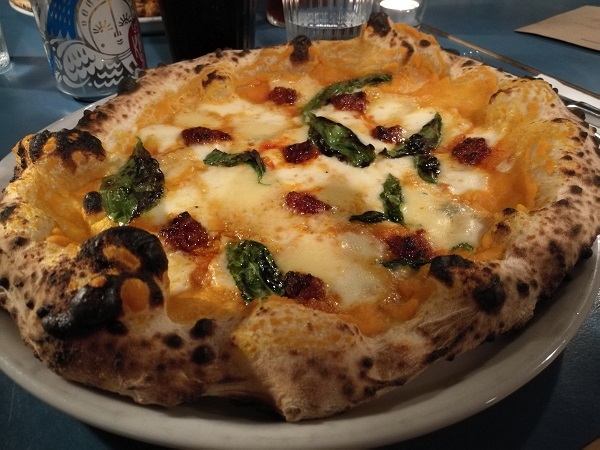 The ever-popular Meat & Heat (tomato, mozzarella, pepperoni and hot honey) had retained its spot on the list, but I was swayed by the Zucca (£12.80): squash purée instead of a tomato base, mozzarella, a local blue cheese, n’duja and basil. And it was beautiful. The silky smooth squash purée was a welcome change from the normal tomato, and added a lovely sweetness that counterbalanced the fieriness of the n’duja. There was plenty of both the blue cheese and the mozzarella and the basil finished the whole thing off nicely. And while you’ll see from the picture that the cheese didn’t reach all the way to the crust (which normally would put me off), it just meant that I could enjoy the crusts properly on their own: doughy, charcoal-blistered and perfectly cooked dough that had a truly delicious flavour. Honestly, if you’ve not yet been to Bertha’s Pizza, pay them a visit. We’ve been a few times in recent years and have never been disappointed: the dough itself is a revelation, the toppings are of exceptional quality and different to the norm, and the atmosphere is relaxed and inviting. They also have some fantastic homemade gelato on offer each day (including a vegan option), and they do takeaway pizza too. Plus, they’re right on our doorstep, so what’s not to love…?